Friday October 5, According to Article 90 of Ukraine’s constitution the president of Ukraine today has the constitutional authority to dismiss Ukraine democratically elected parliament. 30 days following the date of the Autumn session of parliament which was scheduled for September 4. It is argued that as a result of the resignation of over 150 parliamentary opposition members the parliamentary session held on September 4 was Constitutionally inquorate. Therefor October 5 is the first date in which the president can constitutionally dismiss Ukraine’s parliament. The resignation of opposition members of Parliament has set a precedent in which any opposition can force a democratically elected to fresh elections at will. 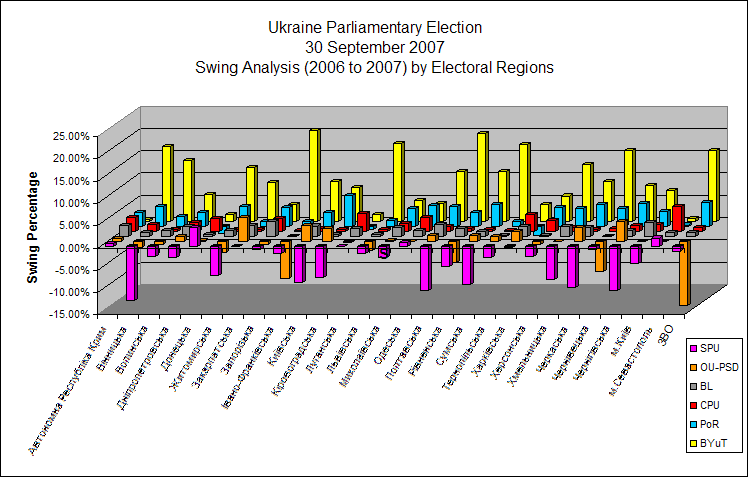 Ukraine can expect to hold fresh elections to be held simultaneously with Ukraine’s presidential elections due in 2009 if not earlier. Exit polls from Ukraine’s September 30 Parliamentary elections are indicating a divided country with Bloc Yulia Tymoshchenko along with Party of Regions maintaining leading poll position. The final outcome of the poll is unknown, Exit polls are not accurate, what is clear, as was anticipated is that Ukraine remains bitterly divided, a situation made worst by the president’s unconstitutional power play. 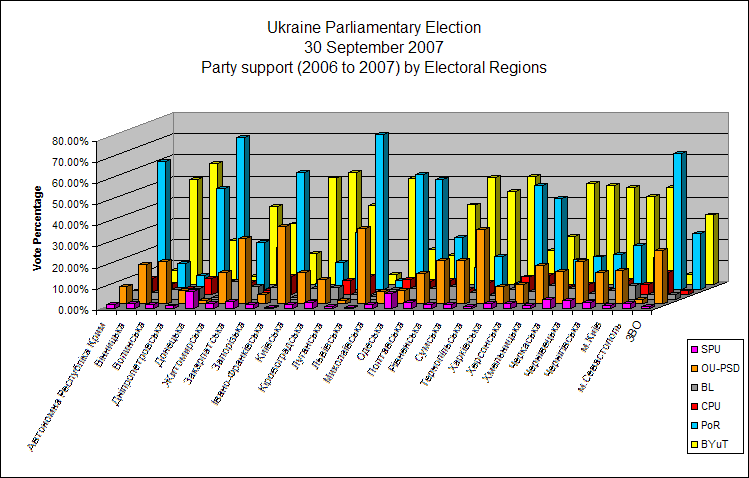 The Exit Polls show the Our Ukraine – People’s Self Defence Party having lost ground. The Our Ukraine and People’s Self-Defence alliance was expected to poll much higher. 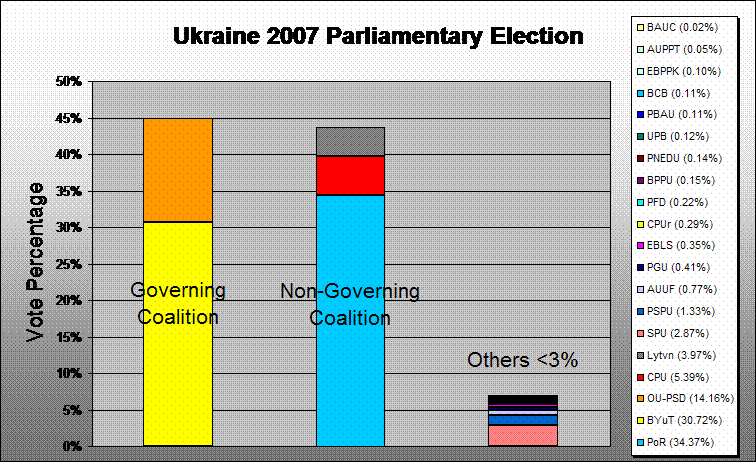 Victor Yushchenko, Ukraine’s President had campaigned extensively for his party from the president’s pulpit. Yushchenko was on National Television every night and even made an address to the Nation on the eve of the election. 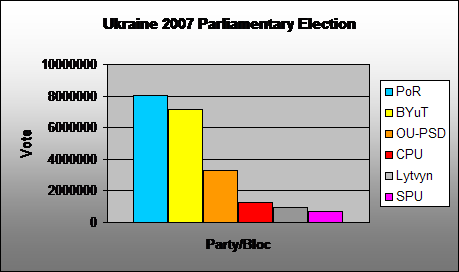 In spite all his efforts and the merger/takeover of the people’s self defence party the President’s party has not improved on their 2006 vote. The outcome of the September 30 poll has severely damaged the standing of the Office of the President. Viktor Yushchenko is now captive to Bloc Yulia Tymoshenko whose leader Yushchenko had previously dismissed as Prime Minister back in 2005. Yushchenko may retain the office of president if Yulia wins but he will very much be captive to her and subject to all her whims. If he steps out of line his career will be short lived. Yushchenko will be seen as a lame duck president beholden to the gas princess. If the economy takes a turn for the worst as it did back in 2005 the president will have little opportunity to decide what to do. under Ukraine’s Constitution once the new parliament is formed he can not dismiss the parliament over the next 12 months. Like or hate it the president is there at Yulia’s beck and call. 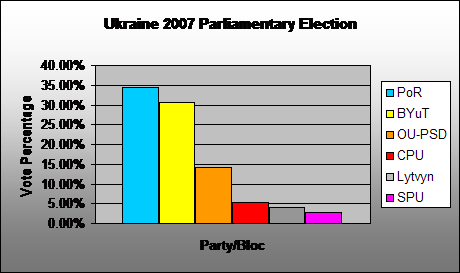 The only party to substantially gain voter support was Yulia Tymoshenko, up from 22 % in 2006 to just over 31%. The other three winners, each gaining around 2% of the vote was the governing coalition Party of Regions, the Communist Party and Party Lytvyn (Ukraine’s former parliamentary speaker). As predicted Lytvn could hold the balance of power. The Socialist Party on 2.5% of the expected vote falling just short of the 3% threshold has been the hardest hit. It’s support base was the tragedy of the opposition campaign. 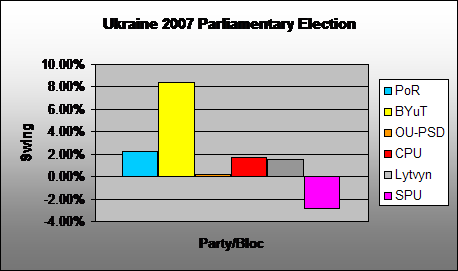 Other parties including the progressive socialist party of Ukraine failed to improve on their vote. Preliminary Analysis of the overall Vite shows little change from the 2006 election. The Opposition hold the advantage but did not secure an absolute majority of the overall vote. If the minor parties votes were able to be distributed as would the case in a preferential ballot the socialist party would have most likely secured sufficient votes to be elected or the votes for minor candidates would have flowed to the Government parties. The outcome of the election is still in balance. the final results have not been declared nor have the positions of the major players. Lytvyn has called for the formation of a Grand Coalition which would involve the Party of Regions but given Yulia Tymoshenko’s undertaking during the election campaign a coalition between her party and Party of Regions is unlikely. That leaves a possible coalition between Our Ukraine and Party of Regions. It is also difficult to see on what basis such a coalition could be forged. One suggestion is that both Yushchenko and Yanukovich agree to step down to allow a marriage of unity to be formed. Again this is unlikely. Another possibility is that the Party of Regions disputes the legality and outcome of the poll and in doing so refuse to recognise the new parliament until the constitutional Court first rules on the question of legality of the president’s decrees dismissing Ukraine’s V parliament. The losing Party can refuse to take the oath and as such the new parliament can not be formed with the old parliament maintaining office until the matter is resolved. The Constitutional Court still has not ruled on the question of legality of the president decrees. Under the provisions of Article 90 of Ukraine’s constitution our the president does not have the authority to dismiss the parliament until at least October 5 and as such the election held on September 30 could still be declared invalid. It would be difficult for the government to play this card but it is not yet out of the question. The Crisis is not over yet. What is clear is that the election has divided Ukraine and weakened the role of the president. Unless some serious revision of policy is undertaken Ukraine could very well see itself back at the polls within the year. 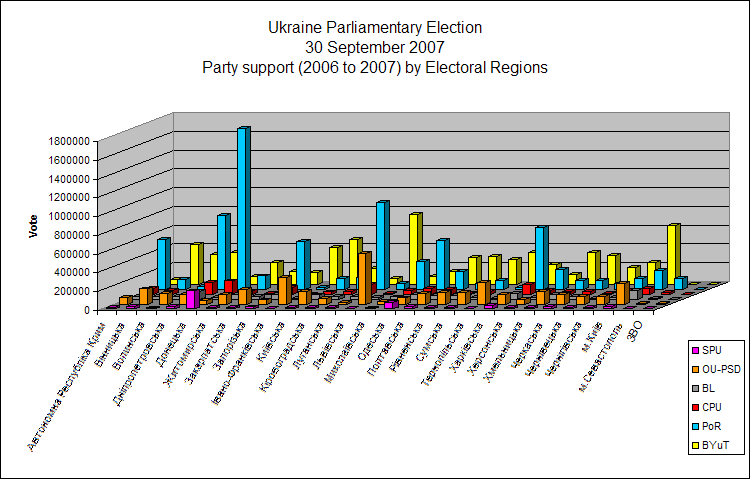 You are currently browsing the Ukraine Today blog archives for October, 2007.